German submarines attacked many merchant ships bringing food from other countries into Britain as they were slow and lightly armed. This led to a shortage of some foods as it was much more important to carry war materials like oil on guns on them. Before the war, Britain imported 55 million tons of food. A month after the war had started, this figure had dropped to 12 million. On 8th January 1940, rationing was introduced in Britain to control the amount of everyday items people could buy in the shops so that supplies wouldn’t run out. Each person could only buy a fixed amount of certain foods each week so that everyone got a fair share. 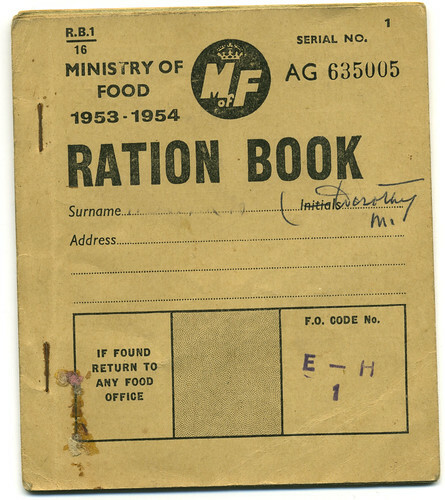 Families were given a ration book and they could only buy their ration from certain, local shops. The shop keeper cut a coupon out of the book every time they bought a rationed food. They were then not allowed to buy any more of it until the following week. pregnant women, nursing mothers and children under 5 had a green ration book – they had: first choice of fruit, a daily pint of milk and a double supply of eggs. Butter, meat and fresh eggs were among the first foods to be rationed. In their place, people were encouraged to use: margarine, corned beef and dried egg powder. Queues formed quickly outside shops when rumours spread that it had a supply of a hard-to-obtain food. Some people even joined queues without knowing what was at the end of them! sweets: 350g (12oz) every four weeks. Some foods were not rationed, including: fresh fruit, fresh vegetables, bread, breakfast cereals, tinned meat, coffee, condensed milk and poultry. Fruit from overseas was extremely rare – many children grew up not having ever seen an orange or banana.